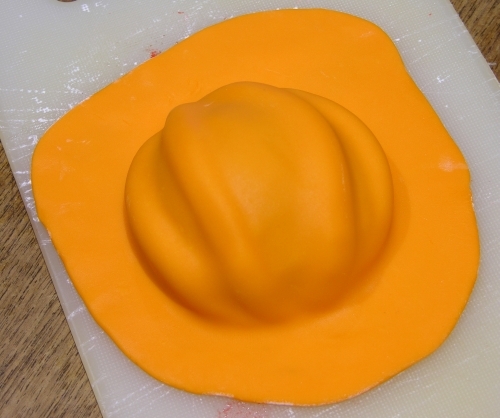 Recently I showed you how to use the Nordicware Cookie Cup pan to make 3D Candy Filled Baseball Cap cookies. I bought this pan of my own accord and have received no compensation from Nordicware. If you don’t have one and don’t want to get one, you could do this technique with an oven-safe cakeball pan, sphere cake pans, or possibly even a muffin pan if you’re prepared to have the result be a different size or less spherical. Halloween is in a couple of weeks, so here’s how to use the same technique to make easy Jack-O-Lantern versions instead. This would be a great activity for a group of kids, especially if you prepare the base cookies in advance and just let the kids wild with the fondant. To make the base cookies, follow the directions starting at ** Base Cookie ** through to ** End Base Cookie ** on the baseball cap post. These don’t have to be perfect; they are forming the textured base for the rippled pumpkin shape. Some of you are decent folk who will look at this pattern and see a sort of birdcage. Others are like me and see another version of a Facehugger cookie. 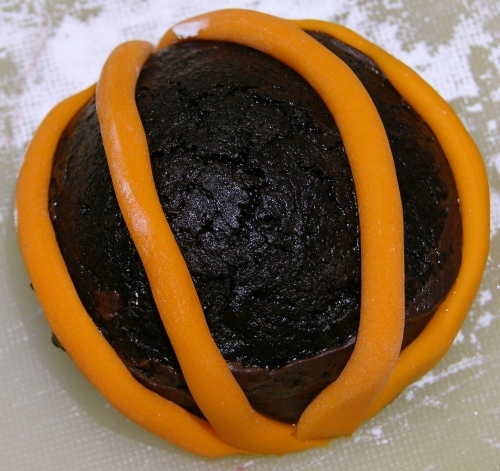 Roll out some orange fondant thinly (thin enough to not overload the cookie, but still thick enough to not show the dark cookie underneath) in a rough circle much wider than your cookie. Brush the cookie and ropes with corn syrup thinned with water, and lay the rolled out fondant over carefully. 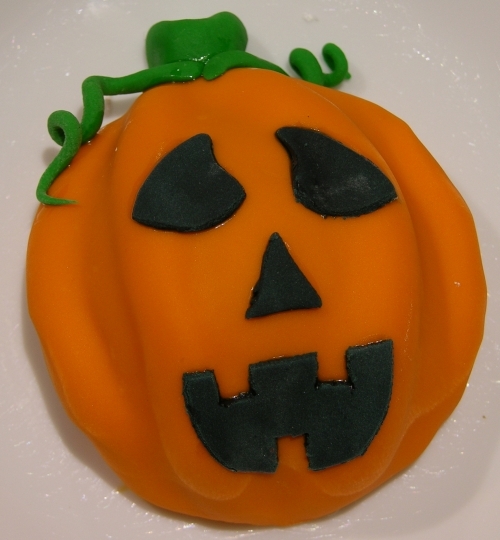 Use the sides of your pinky fingers to gently nudge the fondant between the ropes to create a pumpkin-like ripple and be sure that the covering is sticking to the cookie all over. Tuck fondant down between the ropes to give an overall smooth finish. Trim the excess away using a sharp knife or pizza cutter, working at an angle along the bottom edge inwards to tuck the fondant completely around the sides. You don’t want any cookie showing through. Make a little green stub of a stem and adhere it to the top with some water. Roll out some thin, tapered ropes and twist them into curls to affix alongside the stem. Then roll out some black fondant very thinly and cut out facial features as desired. Your Jack-O-Lantern can be silly, scary, or any style you like. Stick the black pieces on with a bit of water and voila! If you’re making a lot of these, small triangle or other cutters can speed up the process. I took this one to a bake sale for donation so I don’t have a photo of it being cut open, but it had the same M&Ms in it as the baseball cap cookies. For Halloween, though, you could put candy corn or any other treat in there. This entry was posted in 3D Cookies, Cake Decorating, Cookies, Experimental Techniques, General Freakishness, Working With Kids. Bookmark the permalink.